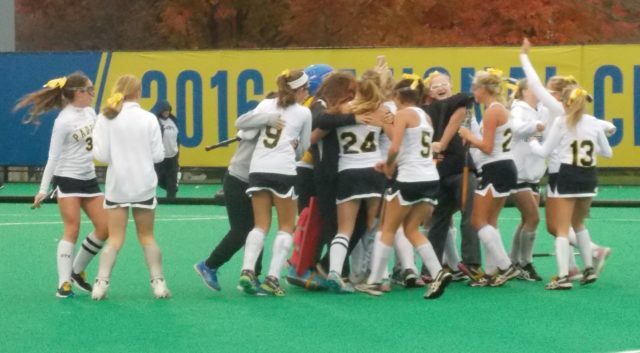 Padua celebrates its 1-0 win over Wilmington Charter in the Division I field hockey semifinals. 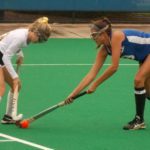 NEWARK – Padua advanced to the state Division I field hockey final after a 1-0 win over Wilmington Charter in the semifinal round in a matinee on Nov. 13 at Rullo Stadium at the University of Delaware. 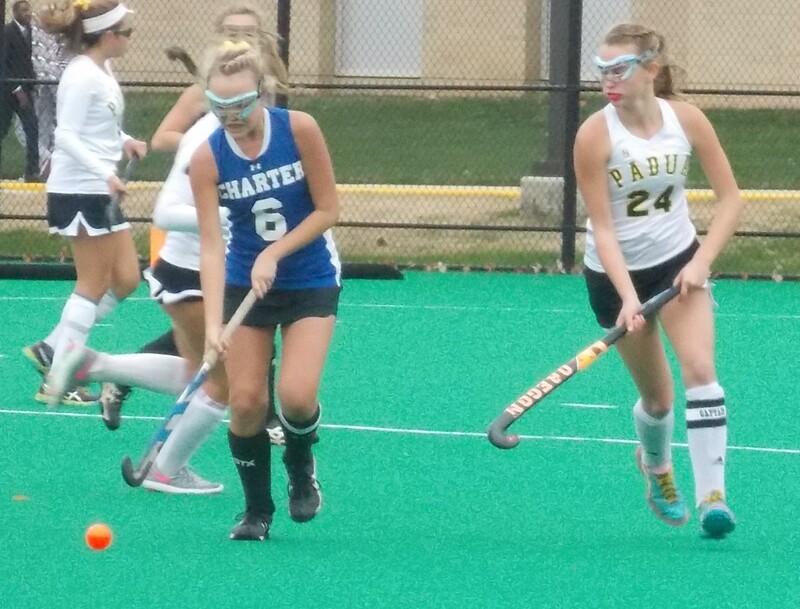 The Pandas prevailed thanks to a goal from Riley Hickox and some timely saves by Shannon McCormac. 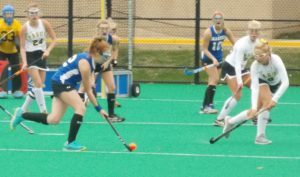 The Pandas will play Cape Henlopen, which has won six state championships, including last year in Division I, the first year of a split tournament. No matter who the opponent turned out to be, it was celebration time for the Pandas, who are in the final for the first time. After a first half that lacked offensive opportunities, the fans on hand were treated to a much faster-paced second 30 minutes on a cold afternoon. 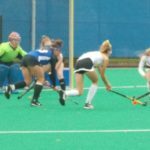 The Pandas’ first chance came just 1:15 in, when Karson Curran dribbled around a defender and sent a backhanded pass toward Force keeper Gabby Simmons. Andrea Taglione was there, but Simmons denied her shot, keeping it scoreless. 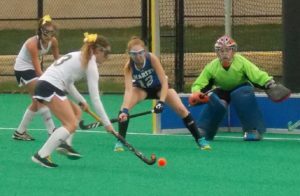 Second-seeded Padua earned its first penalty corner of the second half about two minutes in, and they would capitalize. Taglione inbounded the ball to Hickox near the top left of the circle. 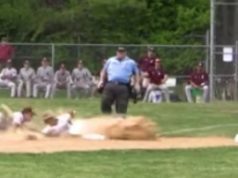 Hickox sent the ball up top to Anna Getty, then moved a few feet toward the cage. 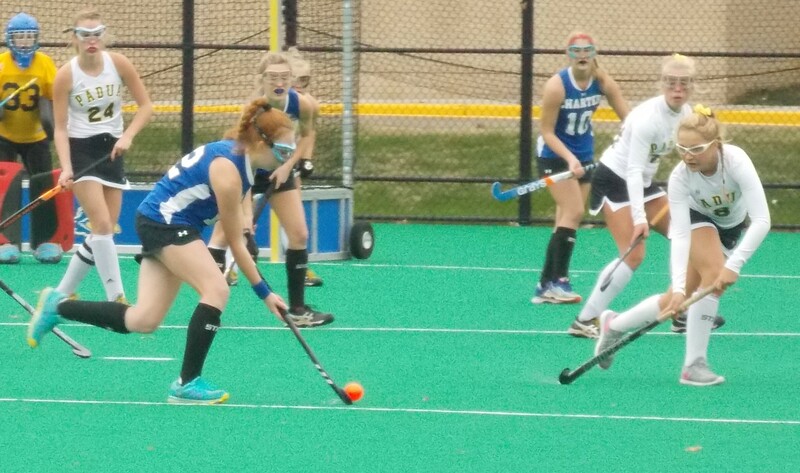 Getty returned the ball to Hickox, who swept a one-timer into the far corner with 26:50 on the clock. “Great insert from my teammate, Angela, and Anna passed it right to me, and I just sweeped it into the back corner, and we all just watched it go in and celebrated,” Hickox said. Over the next 10 minutes, the Pandas had several chances to add to the slim lead, but Simmons and the Force defense was able to keep them out. Padua appeared to have scored with 19:27 left, but the goal was disallowed after the referee ruled that the inbounds pass never cleared the scoring circle. Charter, which had the better of the opportunities in the first half, finally got some offense going in the second following a green card to a Padua player. 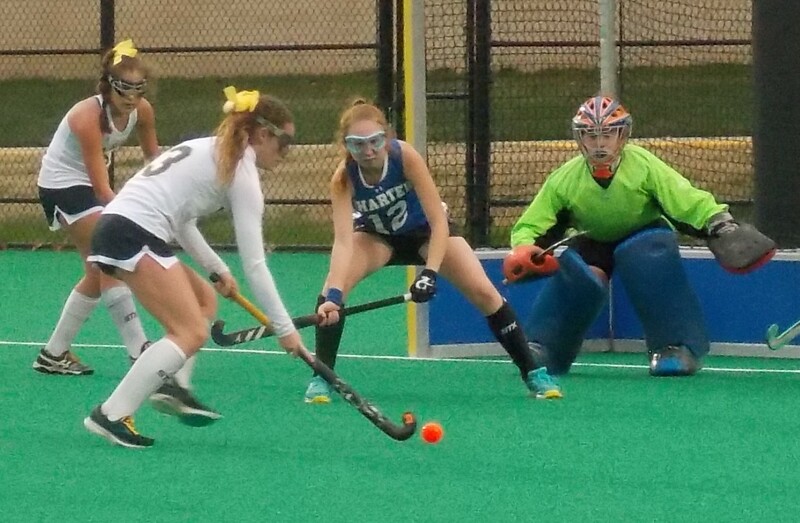 The Force, seeded third, picked up consecutive penalty corners with less than 12 minutes to go, but McCormac came up with a save on one, and the defense blocked another shot. On that second corner, a Charter shot rolled into the cage, but the referee’s whistle had clearly blown to award the corner seconds before the shot went in. What may have been the Force’s best chance came with approximately 11 minutes on the clock. 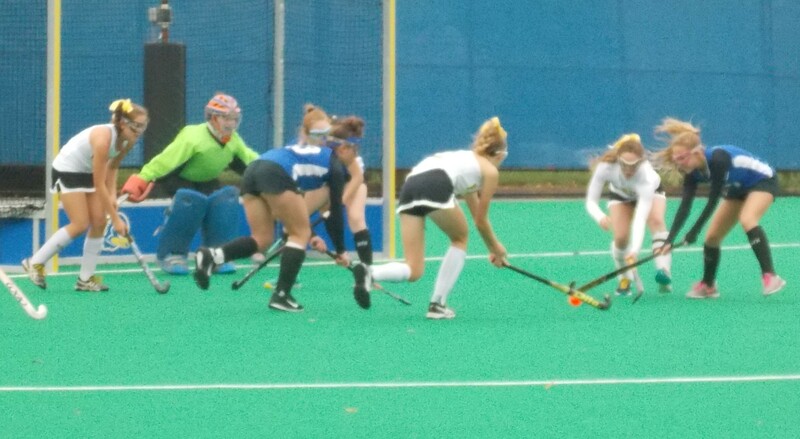 Off another corner, a Padua defender blocked a shot, and McCormac made a sliding stick save on the rebound. Charter swung and missed on that rebound, giving the ball to the Pandas. 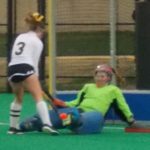 “Once it got through my defenders’ pads, it was a little nerve-wracking, but I knew if I just put my heart out there and got to the ball, I could get it out,” the keeper said. 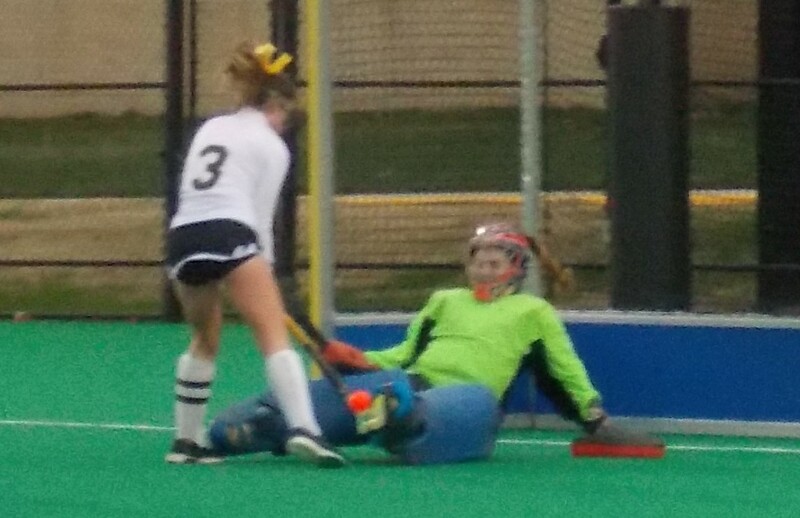 McCormac came up with a kick save two minutes later, and Padua regained some momentum after that. The Pandas had their own chance at the 8:30 mark, but Simmons kicked the ball clear, and a rebound shot went off the side of the cage. 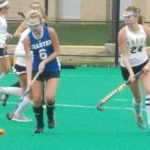 Charter’s last best opportunity, with four minutes left, dissipated when a pass rolled through the crease and out of bounds. Each team finished with eight penalty corners. Padua outshot the Force, 9-7, and improved to 16-1. 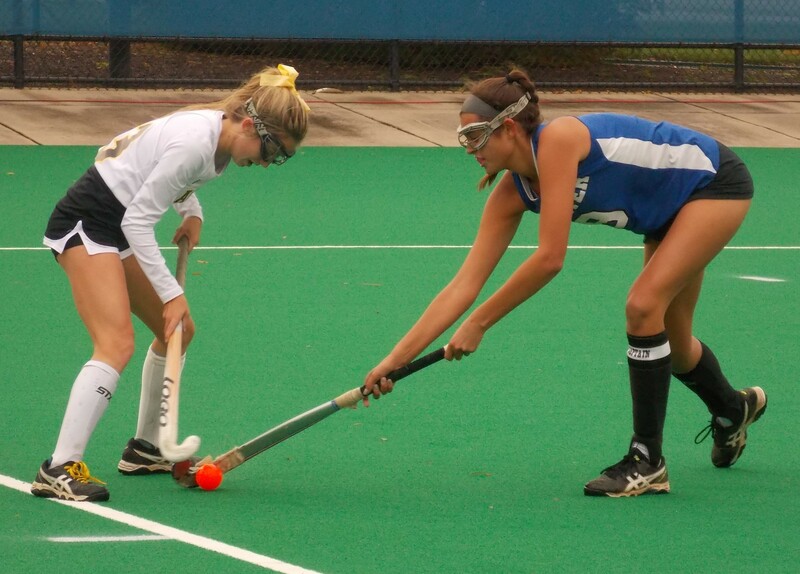 The lone loss came to Cape Henlopen in the final week of the regular season. 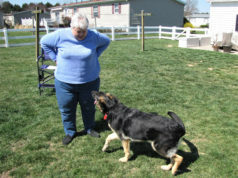 They are ready to make that final step. “Having really great tournament runs my first two years it’s amazing to make history with my team. 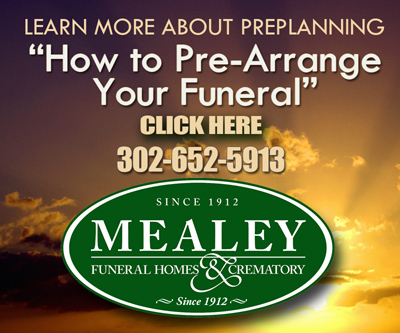 We couldn’t have done it without each other,” Hickox said. Simmons had five saves for the Force, who finished the season at 12-5.